February is National Children’s Dental Health Month! 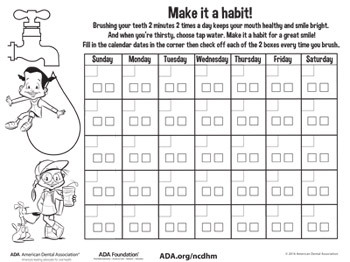 Sponsored by The American Dental Association, along with the ADA Foundation, this month-long national health observance brings together thousands of dedicated dental professionals, healthcare providers, and educators to promote the benefits of good oral health to children, their caregivers, teachers and many others. 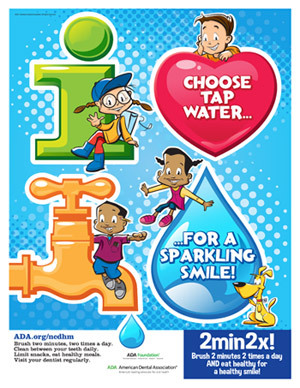 This year’s NCDHM campaign slogan is “Choose Tap Water for a Sparkling Smile”. 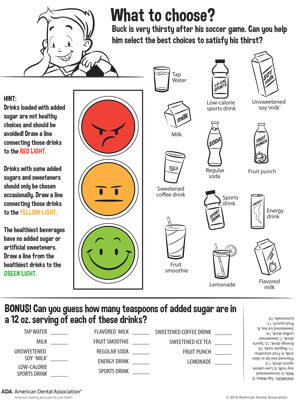 Throughout the month, the ADA will be encouraging parents and kids to choose tap water, when possible, to quench their thirst, and avoid drinks with added sugar like soda and sweetened juices. Also important is maintaining good oral health by brushing, flossing, and eating healthy. We invite you to help spread the message — together we can help keep smiles sparkling! Click on the images below to download a poster, activity sheet, and calendar activity for yourself!